Diving in Aruba is famous for the spectacular shipwrecks and interesting coral formations that dominate Aruba’s underwater realm. This includes the 400 foot Antilla wreck—the largest wreck in the Caribbean. Most of Aruba’s dive sites lie along the protected western and southern coasts, a short distance from the hotels on Palm Beach. 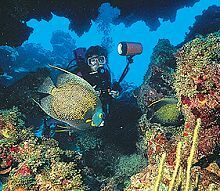 Aruba’s waters are rich in exotic marine life, including stingrays, moray eels, manta rays, barracudas and yellow tail. A large, shallow sand plateau surrounds Aruba making boat travel the most convenient method of reaching the off-shore reefs. Interesting coral formations are found from shallow water depths of 20 to 100 feet, with little or no current and flat surface conditions. 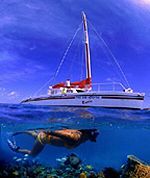 Over twenty more dive sites are shared by the dive operators on the island, and Red Sail Sports offers a weekly dive boat scheduled to the best of these sites. 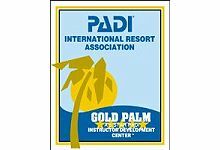 Palm Beach, Aruba - PADI 5 Star Dive Centers meet criteria that reflect continuing dedication and commitment to supporting PADI's Three Es of diving Education, Equipment and Experience. The IDC rating shows a strong commitment to developing dive professionals by providing educational programs from entry level through instructor training. Red Sail Sports is the first and only dive operator on the island of Aruba to achieve the prestigious PADI 5 Star IDC Rating. PADI's logo has become an international symbol of dive excellence, quality and professionalism. As a PADI 5 Star Dive Center PADI has recognized Red Sail Sports Aruba for their dedication to providing the greatest levels of service and standards for diving consumers.